In the first week of November 2016, globally renowned and popular astrologer Ankit Sharma received another significant award in form of the "Saksham-2016 Award" from a social organization named as Jyotish Shakti Sangh of Ambala Cantt., Haryana. 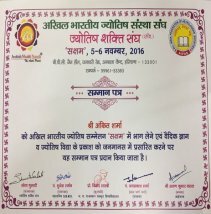 This dignifying award was given to him during a mega astrological event named as the Akhil Bhartiya Jyotish Sammelan - SAKSHAM, which was held from 5th to 6th November 2016 at BPC Jain Hall, Ambala Cantt. 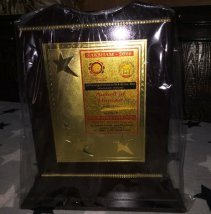 This prestigious award was conferred on him for participating in the grand astrological seminar, and disseminating highly beneficial and elusive knowledge related with Vedic Astrology to benefit people in general. Here, it may just be briefly informed that, before this award, many high and dignifying awards have been won by him recently, for his world-class and highly generous services in the sector of Vedic Astrology. To know about these awards, please visit other webpages of this globally famous and reliable service-website of India. By virtue of utmost effective, impeccable, and cheaply-charged services connected with all above fields, master and grand astrologer Ankit Sharma has earned immense fame and credibility in countries worldwide, especially in the majority of major cities and urban agglomerations of India, numerous other Asian countries, a large number of European nations, Australia, South Africa, and many North American nations (inseparably including USA and Canada). As he is a righteous and benevolent person, he cherishes to provide highly efficacious and satisfying solutions with no side or ill effects. Moreover, his services are highly refined and fully potent enough to solve a problem for all future years of life. Bad and worsening relations with family members, relatives, friends, neighbors, officials, etc. Struggling and grueling careers of celebrities active in the fields of films, sports, politics, etc. And problems and disputes related with other spheres of life. If you are living a painful or gloomy life caused by anyone or more of the above-mentioned problems, then just call over: +91-98154-18307; or send your descriptive mail to: info@AstrologerAnkitSharma.com; for making your life happy and bright.